It's time to play "What's In The Box?" 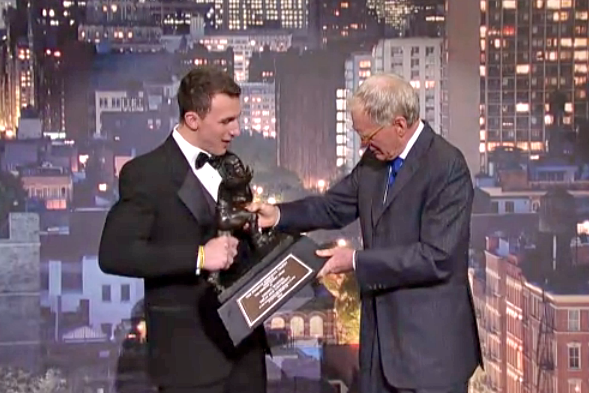 Hint: Johnny Manziel, the young man about to get out of the SUV, is this year's Heisman Trophy winner. So, the box must contain either the Heisman Trophy, or the mummified head of legendary football coach John Heisman. Have you made your guess? Whew, that could have been unpleasant. And now, as promised in the previous entry, here's your bonus photo of Anne Hathaway. I took so many nice shots of her that I'll be including outtakes in every entry through the end of the year. So with this entry, you win even if you're not a sports fan. If you're a fan of mummified heads, though, I can't help you. Isn't Regis Philbin the resident mummified head at the Late Show? Bada-bing, bada-boom! Good guess, but in the CelebriGum post of May 7, 2011, we established that the remains of Ed Sullivan are kept in a closet in the basement of the theater. I think Ed's head is the mummified head emeritus. I can't wait for my 2013 Celebrigum Anne Hathaway calendar to arrive! That's not a bad idea. Shutterfly and those places do a nice job. Slightly less conceptual: I could offer a 2013 CelebriGum calendar with various greatest hits. Slightly more conceptual: A 2013 CelebriGum "Mayan" calendar where everyone's dead except for the gum, which is already dead. Hey... I really LIKE that idea of a CelebriGum calendar! Check into it, buddy. I'm serious. Maybe I'll float the notion on the Facebook page. If I can get a few people interested, I'll look into it. Maybe the gum could have a podcast, too.